Cancer is a collection of hundreds of related diseases. One thing they have in common is that the body’s cells begin to divide without stopping and spread into surrounding tissues which is invasive and life threatening. Cancer is a unique experience for each individual. No doubt it is extremely distressing for the cancer patient, family and friends. Oncology massage is a gentle, nurturing and effective therapy that safely addresses the needs of a cancer patient or anyone with a history of cancer (or other degenerative illness). Oncology massage therapists understand the science and pay close attention to the physical, emotional and psychological needs of a client during diagnosis, treatment, recovery, survivorship or palliative care. Oncology massage therapists are highly trained and equipped for different types of cancer and other health conditions and will make adjustments for a person’s current state of health. We design a suitable treatment plan for the individual with cancer and make site, position and pressure adjustments. Most importantly we ensure that we cause no harm. Oncology massage therapists are trained to treat the person holistically ensuring that the massage is personalised for the clients unique experience in the present moment. When giving an oncology massage treatment I remain mindful and quiet throughout treatment to ensure the individual experiences deep relaxation. No way! Massage does move lymph fluid but so does walking, exercise and other activities. Exercise has been proven to be beneficial for people with cancer so doctors aren’t going to advise against that. Generally doctors are supportive of patients getting massages with suitably qualified oncology massage therapists. If cancer spreads (metastasis) it will not be because a cancer patient had an oncology massage. 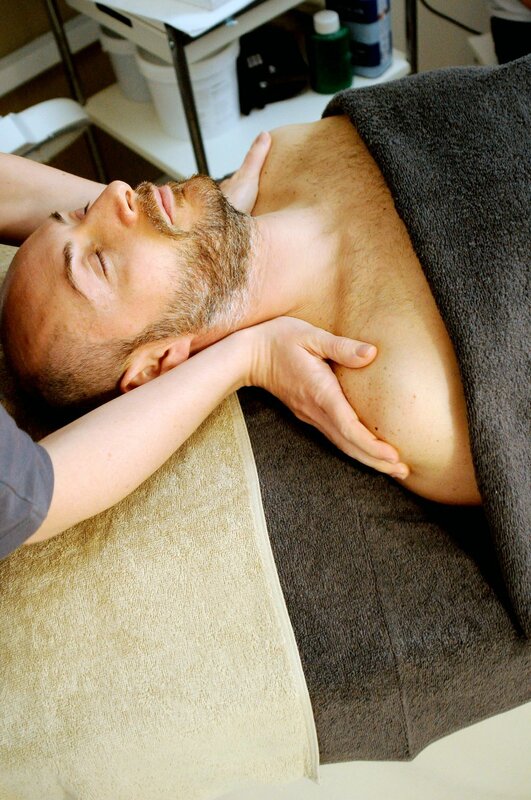 Oncology Massage is deeply relaxing because of the gentle and slow strokes. The pace of the massage causes the mind to slow down and the nervous system to relax. The client will often feel more present awareness and calm because of this, and a feeling of wellbeing during and after treatment. Mechanoreceptors are sensory neurons that respond to mechanical stimuli such as touch and pressure, and are located within joint capsular tissues, ligaments, tendons, muscle, fascia and skin. Skilfully stimulating these mechanoreceptors using different techniques sends messages to the central nervous system (the spinal cord and then to the brain). The central nervous system then sends a signal back to the muscles to change their tonus. This is how massage therapy works. Fascia is a fine connective tissue matrix surrounding every tissue in the body including bones, muscles, and organs. There are several types of mechanoreceptors that respond to different forms of touch and movement. Deep tissue and vigorous massage techniques are not suitable for a cancer patient as there are risks such as lymphoedema, bone fractures, and their bodies aren’t as strong as they once were and are easily fatigued. Of all the mechanoreceptors, the interstitial receptors are the most abundant, and they are located abundantly within the fascia. About half of the interstitial nerve receptors respond to gentle touch. The interstitial mechanoreceptors are also linked with the autonomic nervous system. This means that when stimulated by gentle and soothing touch they send a signal to the autonomic nervous system, stimulating the parasympathetic branch of this system - causing the ‘relaxation response’. Tension and pain in muscles will therefore be reduced or eliminated and sometimes general pain in the body will also cease. Good feeling neurohormones may be released during massage, such as serotonin, oxytocin and dopamine, and stress hormones such as cortisol may be reduced, as some research has shown. Clients often report a feeling of well-being and reduction or cessation of pain. Many clients also report feeling less anxious or less depressed after the massage, and more generally as a result of regular massages and other therapy. In various medical research studies massage has been shown to be effective for side-effects of cancer and cancer treatment such as: pain, anxiety, depression, insomnia, fatigue and nausea. I’m going to discuss a few of the symptoms a person may experience as a result of cancer and cancer treatment, and how massage and related treatments can help. Tension can build in the body due to change of activity - e.g. being an active person to now resting a lot, sitting, and so on. Tension also builds due to stress as we may tense parts of our body unknowingly. Massage therapy is very effective for muscular tension and pain. Massage can also take a person’s mind off of the cancer pain - bringing their full attention to the parts of their body being massaged, and because of the relaxation response the person may receive relief from that pain for a while after the massage too. Once a person receives a diagnosis of cancer it is common for the stress response to kick in - known as “fight, flight and freeze response” - meaning the sympathetic nervous system branch of the autonomic nervous system has been activated. The stress response directs our body's energies to the systems that will help us to get out of danger - increasing our heart rate, alertness, strength and speed. Often this can be hard to switch off - to get back to the relaxation response otherwise known as “rest and digest” (parasympathetic nervous system). Activating the parasympathetic nervous system turns off those biochemical reactions (that can be harmful if experienced long term) so that our heart rate returns to normal, our body can digest properly, our immune system can work well again and our body can relax and repair itself. The stress response often affects sleep and many cancer patients suffer with insomnia. Thankfully there are many things that can help turn off the stress response which can lead to better sleep. Mindfulness and massage therapy can be really helpful for this. Massage therapy can even be used as a mindfulness practice - when you focus on the touch and the sensations and keep your awareness on those feelings and your body, you come to the present moment and this can reduce stressful thoughts. It isn’t about eradicating thoughts completely, more so just bringing your attention back to the body (or breath) over and over again, and accepting whatever thoughts and feelings arise in the moment. Mindfulness is about being conscious and in the present moment and is great training for the mind. Anxiety is another common side-effect of cancer and is a person’s response to stress. Understandably, after diagnosis a person experiencing cancer and all that it entails may begin to worry a lot. A cancer patient experiencing ongoing anxiety is likely to benefit from several forms of treatment such as counselling, the emotional freedom technique to help move ‘stuck’ emotions, gentle and slow yoga classes, meditation classes, walking and other mild exercise, acupuncture and massage therapy. Nutrition can also be a factor so seeing a naturopath is a good idea. It is important that if you are experiencing anxiety you do tell your doctor and make a plan to manage it. Anxiety is on a spectrum - it can be mild to extreme so different approaches are necessary for different people. Like with any life changing event, cancer can lead to depression. What’s even worse is there seems to be this pressure from society to ‘stay positive’ so often a person suffering depression won’t seek help right away. If you have been experiencing a low state for a while and losing interest in normal activities or suspect you are depressed then I would recommend speaking to your doctor and finding a good counsellor to talk to. People with cancer often don’t want to ‘burden’ their family and friends with their feelings and they often try to protect them by repressing their true feelings. Or if they do start to open up about their feelings they may have people who don’t seem to be able to handle that and shut down the conversation (often not realising they are doing that - these ‘roadblocks’ to communication are used all the time in our society). It’s great if family and friends can be supportive and open the conversation and really listen, and professional support is going to be very important. In research studies massage therapy has been shown to be helpful for depression and it is something pleasurable and nurturing to look forward to. Oncology massage has been shown to reduce fatigue for those having chemotherapy when massaged during the chemotherapy session or after. Massage can also help with general fatigue experienced due to cancer treatment or while a person is still recovering from cancer treatment. Is oncology massage going to help with all of these things? Results will vary from person to person. Research has shown that massage improves the quality of life for people with a history or diagnosis of cancer. It reduces the side effects experienced from conventional treatment of cancer and the symptoms of the disease process itself. The thing that isn’t measured in research is the importance of the relationship between the client and the therapist. Usually outcomes are much better if the client trusts the therapist and a connection is established. This is especially the case with therapeutic touch. A therapist who is genuine, compassionate, mindful, engaged and caring is likely to make a positive difference to their client’s experience. When I am giving an oncology massage treatment I am silent and I accept my client just as they are - there is no need to wear a wig, or make-up (unless they prefer to), or dress-up in anyway. I do mobile massage so I can go to my client’s house or they can come to my house - where my treatment room is quiet, comfortable, private and inviting. Whatever feelings arise during the session are okay. I hold space for my client to be in the moment, accept what is, express it if they need to, and experience nurturing, gentle touch. I am currently studying Holistic Counselling and these counselling skills increase my ability to be there for a person the way they need. The main carer of a person with cancer requires a lot of support themselves. It is not an easy job - it takes physical and emotional toll. The carer takes care of the physical and emotional needs of the cancer patient. The carer often will feel like they shouldn’t ask for help because they don’t have cancer. They often put a strong front on for both the cancer patient and for the people around them and often feel guilty when they think of things they want to do for themselves. Carers have higher rates of psychological distress than cancer patients, probably because they feel they are being ‘selfish’ or feel guilty if they express their needs. This means they are less likely to seek out services that can help them, whereas the cancer patient is more likely to use many services to support them as people around them are encouraging them to do so. However it is imperative that the carer takes care of themselves, not only for their own mental and physical health which is very important, but also so that they can continue to look after the cancer patient. Carers are at risk of burn-out and mental breakdown, which can lead to physical illness too. When offering help to a cancer patient or to one of the main carers, be specific. For example offer to come around at a specific time to help with cleaning or cooking, and give the carer a few hours off to do something for themselves while you are there for the cancer patient. This gives them time to rejuvenate and have their needs met. If they have kids, offer to take them to soccer practice, dance classes, and so on. Offer to and drop around healthy cooked meals, even if that means leaving it at the front door and texting them if you are concerned you will disturb the cancer patient. Importantly, open up the conversation - invite the carer to talk about their distress and really listen. Don’t offer advice, just listen. Sometimes people just want to be listened to and understood. Massage therapy is also a great way for the carer to have some self-care time, where they can feel relaxed and nurtured so you could book them in and offer to care for the cancer patient during that time. Remember that finances may be an issue too, so consider buying massage vouchers together with some friends for the cancer patient and the carer. Of course you’ll need to check that the person likes massages (most people love massages but not all). I’m in the unique position where I can provide oncology massage to the cancer patient and then perhaps an aromatherapy massage to their carer straight after - aromatherapy massage is rejuvenating for the mind, body and emotions. This way both the cancer patient and the carer have some nurturing time and then can relax and enjoy the rest of the day. Oncology massage can be claimed on health insurance depending on your level of coverage and your health fund (for a list of funds I have a provider number with please see the Pricing page). Aromatherapy is also a natural complimentary therapy that can be helpful for cancer patients - it may help relieve headaches (inhalation and massage), nausea (inhalation), digestive issues (tummy massage), anxiety (inhalation, massage, aromatherapy bath, foot bath), depression (inhalation, massage, aromatherapy bath) and insomnia (inhalation, massage, aromatherapy bath, foot bath). However more research needs to be done - I’ve included some research below for you to check out. It is important to note that some essential oils have an effect on women’s hormones and for healthy individuals this is a great thing - they often help to balance women’s hormones. However for some people with oestrogen dependent cancers certain essential oils may interfere with chemotherapy drugs - the ones that repress oestrogen to prevent cancer from returning. As an aromatherapist I have the required knowledge to provide essential oils and aromatherapy treatments that are safe for cancer patients as I know which oils not to use for these particular cancers, and the safest essential oils to use for cancer patients generally. I would always recommend you see a professional natural medicine practitioner prior to using natural medicine. Just because it is natural, doesn’t make it weak or harmless. Natural medicines can be very beneficial if used correctly and holistically. I sell essential oils at my practice so if you are interested in using them to improve quality of life, relieve stress and so on, please feel free to contact me and purchase therapeutic grade essential oils directly from me. I didn’t know I would end up working in oncology massage. When I first started my massage therapy studies the lecturers warned us not to massage a person with cancer. There wasn’t as much knowledge back then (eleven years ago), and the knowledge and research that was out there took a while to filter down into the education system. However it is for good reason we were warned - a cancer patient or person with a history of cancer should not have a deep tissue massage as the risk for lymphoedema increases with deep tissue massage, as do bone fractures and other complications. Whereas oncology massage therapists are trained to deliver massage that is safe for the individual’s current condition and will not cause lymphoedema. We are also trained how to ensure we do not worsen lymphoedema for a person with it. It is important to note here that oncology massage is not lymphatic drainage massage - that is another modality. Most of my direct relatives on my mother’s and father’s side who have died have died as a result of cancer, and the death of my aunty affected me the most because she was a kind and gentle person, animal lover (she wouldn’t even kill a spider!) and died at just 50 years old. I consider that quite young. I have friends who lost one or both of their parents to cancer while my friends were still young. One of my class mates just after high school passed away too - that was a shock, she was only 18 years old. I have an uncle in South Africa with stage four bowel cancer. I think it is safe to say most of us have been affected by cancer. When I think about this, it reminds me to appreciate every single day. I strive to live an authentic and joy-filled life and to be myself, be honest and have integrity, be kind and compassionate, and to strive to make a difference to other peoples lives even if in some small way. When faced with mortality it puts our values in perspective. I’m always working on myself, hoping to be the best person I can be, but sometimes spectacularly fail and that’s okay too! We are all human, none of us are perfect. Given my family history, when I heard about oncology massage training a few years ago my heart said yes so I completed Modules 1 and 2 and became fully qualified as an oncology massage therapist. Since then, I’ve worked with many people with cancer and found that the connection I have with each client is unique. I feel compassion for every client and I’ve learned that compassion is endless. (See videos about compassion here: https://www.youtube.com/watch?v=A4a66aFaIME & https://www.youtube.com/watch?v=dQijrruP9c4). Seeing clients feel better during and after their massage makes my heart sing, and when they report the side-effects improving that is even better. Information provided by Essential Restorative Massage is not intended to be a substitute for medical advice, diagnosis, or treatment. If you have a health condition or symptoms of one, please consult with your doctor before using complimentary remedies and therapies. Copyright © Essential Restorative Massage, all rights reserved.